The term Hallux Rigidus describes a limited arthrosis of the first MTP joint. It is an arthritic condition limited to the dorsal aspect of the first MTP joint. Also known as a dorsal bunion or Hallux Limitius, the condition is most commonly idiopathic (but may be associated with post-traumatic OCD of the metatarsal head) and is characterized by an extensive dorsal osteophyte and dorsal third cartilage damage and loss. An associated synovitis may further aggravate the limited and painful ROM. It should be noted that most of the orthopedic literature uses the term “Hallux Rigidus” instead of “Hallux Limitus.” In the podiatric literature, it refer to Hallux Rigidus as the end stage of Hallux Limitus, when motion is absent or severely restricted to the point of near ankylosis. The first MTP joint and the great toe (hallux) provide significant weight transfer from the foot to the ground as well as active push-off. An intact first MTP joint implies a complete and pain free ROM, and full intrinsic and extrinsic motor strength. The primary role of hallux is to enable dorsiflexion of the first metatarsal during the propulsive phase of gait. It has been shown that approximately 60 degree of dorsiflexion is required for normal gait. Limitation of this range of motion results in problem with gait. Two sesamoid bones ( the medial, or tibial, sesamoid and the lateral, or fibular, sesamoid) provide mechanical advantage to the intrinsic plantar flexors by increasing the distance between the empirical centre of the joint and the respective tendons. A foot with increased 1st ray ROM and increased pronation may be predisposed to the condition. Excessive flexibility of the shoe forefoot increases the potential for hyper dorsiflexion of the hallux MTP joint. Trauma- secondary to chondral damage. Excessive pronation of the foot may increase the stresses on the joint and promote development of exostoses. Repetitive weight bearing dorsiflexion of the 1st MTP joint. Aberration of the 1st metatarsal or proximal phalanx. Objective findings-Near normal ROM, pain with forced hyper dorsiflexion, tender dorsal joint, minimal dorsal osteophyte. Objective findings-Painful, limited dorsiflexion, tender dorsal joint, osteophyte on lateral radiograph. Treatment-Symptomatic, consider early surgical repair. Objective findings-Painful, severely limited dorsiflexion, tender dorsal joint, large osteophyte on lateral radiograph, decreased joint space on AP radiograph. Treatment-Symptomatic, consider surgical repair, dorsiflexion osteotomy. Objective findings-Severe pain and limited motion, global arthrosis and osteophyte formation, with loss of joint space on all radiograph projections. The main presenting symptom is usually that of pain around the 1st MTP joint. The pain is often described as deep aching sensation that is aggravated by walking, especially in high heels, or activities involving forefoot weight bearing. Dorsal joint hypertrophy can be a source of irritation from footwear and may lead to pain secondary to skin or soft tissue irritation. In patients with longstanding Hallux Limitus, a distinct shoe wear pattern is seen: the sole demonstrate wear beneath the second MTP joint and the first interphalangeal joint. The sitting examination may reveal decreased ROM in dorsiflexion and, to some degree, in plantar flexion. The ROM becomes more and more painful as the condition advances. Forced dorsiflexion reveals an abrupt dorsal bony block associated with pain. Also, forced plantar flexion produces pain as the dorsal capsule and the extensor hallucis longus tendon are stretched across the dorsal osteophyte. The dorsal osteophyte is easily palpable and typically exquisitely tender. Plain X-ray display the classic characteristics of degenerative osteoarthritis and the degree of degeneration observed will reflect the duration and severity of the condition. Early changes typically include dorsal and marginal osteophytes with well-maintained joint space. More severe degenerative changes are seen in more advanced cases. These changes include narrowing of the joint space, marginal osteophytes, sclerosis, joint irregularities, cystic degeneration, degenerative involvement of the sesamoid and/or first MT head joint, and sesamoid enlargement. Hallux valgus deformity can accompany Hallux Limitus, although it is not common. 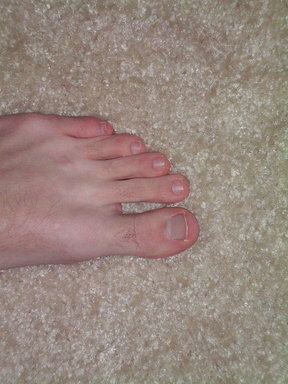 Hallux valgus interphalangeus is more commonly seen. Standard radiographic evaluation includes AP and lateral views of the weight bearing foot. Bone scanning, CT and MRI are capable of demonstrating the condition, but these are not part of a routine work-up. Significant Findings- Chronic condition. Limited dorsiflexion. Dorsal osteophyte on lateral radiograph. Significant Findings- Chronic condition. Lateral deviation of great toe. Tender medial eminence. Increased hallux valgus angle on radiograph. Significant Findings- Chronic condition. Painful and limited ROM. Loss of entire joint space on radiograph. Significant Findings- Acute severe pain tenderness, erythema, joint irritability localized to 1st MTP. Elevated uric acid. Sodium urate crystals. The treatment of Hallux Limitus is symptom based. Acute exacerbations are treated with the RICE (rest, ice, compression, elevation) method followed by a gentle ROM program and protected weight bearing. The Chronic condition is treated with ROM program and protected weight bearing. The 1st MTP joint is supported by shoe modifications (rocker bottom sole), a rigid sole insert, a stiff soled shoe, or various taping methods. A soft upper and deep toe box reduce pressure over the dorsal osteophyte. The joint is also protected by reduced activity levels, increasing rest intervals and duration, and avoiding excessively firm play surfaces. Occasionally, a patient with excessive pronation will benefit from an antipronation orthotic. NSAIDs and Cold Therapy are used to reduce swelling and inflammation. Sometimes, corticosteroid injection to the MTP joint is used as an adjunctive therapy. Operative Treatment Conservative treatment often fails when Hallux dorsiflexion is less than 50 degrees. In extreme cases, cheilectomy (resection of all bony prominences of the metatarsal head and base of proximal phalanx) is required. Occasionally, arthroplasty of the 1st MTP joint is indicated. Rest, ice bath, contrast bath, whirlpool and ultrasound for pain, inflammation and joint stiffness. Joint mobilization followed by gentle, passive and active ROM. Isometrics for muscles around MTP joint. Isolated plantar fascia stretches with a can or a golf ball. Emphasis on Joint mobilization and active and passive methods for increasing flexibility and ROM. Progressive strengthening with towel scrunches, toe pick up activities, seated toe and ankle dorsiflexion with progression to standing, seated isolated toe dorsiflexion with progression to standing, seated supination and pronation with progression to standing. Balance activities including BAPS board. Cross training activities (slide board, water running, cycling) to maintain aerobic fitness. Continued use of protective insert or taping. Running to progress within limits of a pain free schedule. Plyometric and cutting program, with progression. Coughlin MJ, Shurnas PS. Hallux rigidus. J Bone Joint Surg Am. 2004 Sep;86-A Suppl 1(Pt 2):119-30. Coughlin MJ, Shurnas PS. Hallux rigidus: demographics, etiology, and radiographic assessment. Foot Ankle Int. 2003 Oct;24(10):731-43.